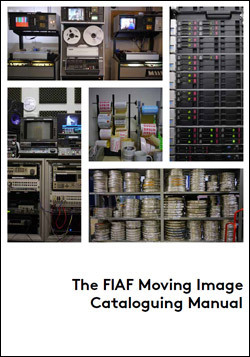 The FIAF Moving Image Cataloguing Manual (2016), published by the FIAF Cataloguing and Documentation Commission (CDC), may now be accessed for free in PDF format HERE. Please note that this is a new, improved and corrected version of the PDF file from the one published in May 2016, and that a paper version of the Manual will be published in October 2016 and will be available for purchase via the FIAF Secretariat or Indiana University Press. The FIAF Moving Image Cataloguing Manual is the result of many years of labor and collaboration with numerous professionals in the moving image field. It is more than a simple revision of The FIAF Cataloguing Rules for Film Archives (1991), as it needed to address the changes in information technology that we’ve seen over the past two decades, and align with existing and emerging metadata standards. Although it is specialized in focus, and draws from modern concepts and standards such as FRBR (Functional Requirements for Bibliographic Records), EN 15907, and RDA (Resource Description and Access), it is designed to be compatible with a variety of data structures. It provides charts, decision trees, examples, and other tools to help experts and non-experts alike in performing real-world cataloguing of moving image collections. If you have any questions or feedback, please contact Thelma Ross at thelma_ross@moma.org.